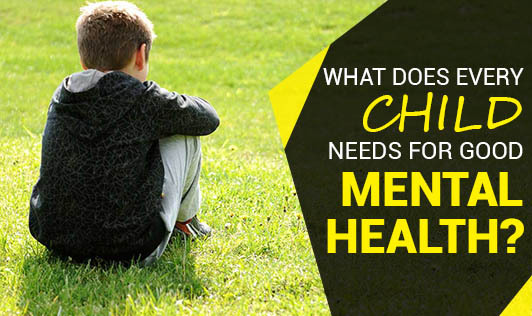 What does every child needs for good mental health? It's quite easy for parents to identify their child's physical needs. However, a child's mental and emotional needs may not be that evident. Good mental health helps a child to think clearly, develop socially and learn new skills. Encouraging words from family is also important for helping children develop self-esteem, self-confidence and a healthy emotional approach towards life. • A child needs to know that your love for him does not depend on his accomplishments. • Mistakes and defeats should be expected and accepted. • Praise your child and be an active participant in his/her activities as your attention helps in building his/her confidence and self-esteem. • Help your children set realistic goals that match their ambitions with their abilities. • Avoid sarcastic remarks when your child fails a test or loses a game. Make it a point to encourage him or her to express their feelings; you may need to give him/her a pep talk. • Encourage your child to do his/her best but also enjoy the process. • Be kind, firm and realistic with your expectations as children's development depends on your love and encouragement. • You cannot expect self-control and self-discipline from your child if you do not practice this behaviour; hence it's important to set a good example. • Encourage playtime as it helps children be creative, develop problem-solving skills and learn self-control. Remember that mental health is an essential part of a child's overall health!